Rumors swirled that external power players had somehow been involved in the decision — an allegation refuted by Tech officials, and also denied with varying degrees of ferocity by Gov. Greg Abbott and Texas A&M University System Chancellor John Sharp, who have both been accused of meddling. Tech’s administrative budget is a small fraction, some 1.2 percent, of the system’s overall costs. 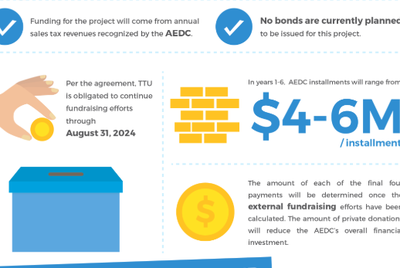 Still, it amounts to millions of dollars a year, and is a kind of expense that fiscally-conservative lawmakers and regents at systems across Texas often deign to be unneeded bloat or overhead. 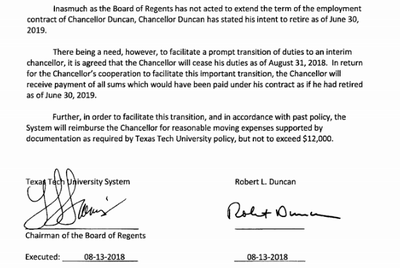 This article originally appeared in The Texas Tribune at https://www.texastribune.org/2018/09/10/robert-duncan-resigned-tensions-simmered-texas-tech-regents/.